Amid the political hullabaloo now engulfing us -- special prosecutors, tell-all memoirs, calls for impeachment, Lord knows what else -- the opportunity to salute Paul Ryan has a cleansing effect, like heavy-duty detergent following a food fight. The opportunity arises on account of Ryan's understandable but saddening decision to quit politics cold turkey. He retires next January not just from the House speakership but also from Congress itself after two decades. He's had it. He wants to reunite with his family. No one who regards wife and children as objects more cherishable than a press conference or a fundraiser can possibly blame him. I have heard critics say, "Aw, big deal: The guy's getting out before Democrats take back the House and fire him." I have heard others say, "So what? The guy's mushy. More pragmatic than conservative." The New York Times' Ross Douthat maligned Ryan by calling him "fundamentally a party man ... a pilot who ultimately let the party choose the vessel's course." More than anything else, that is to misunderstand (and Times writers are never supposed to misunderstand anything) the dimensions of the dark pit into which electoral politics has fallen. The political game, in our deteriorated time, is about addressing and solving every human problem and conundrum, as opposed to enabling responsible citizens to solve as many of their own problems as possible. The confusion among responsible politicians concerning what to do is a function of a mess that's been getting messier since the New Deal: government extensions of favor requiring more and more money, with public dependency on these favors enmeshing voters and their representatives more and more deeply, shutting down the exits and escapes. How do you spend less money on hyper-costly Medicare, Social Security, Medicaid and the like? Basically, you don't; political reality doesn't permit it. A revolt of the beneficiaries against the benefactors is not a wholesome prospect for men and women looking forward to lifelong careers of public, um, service. So you do what you can do. 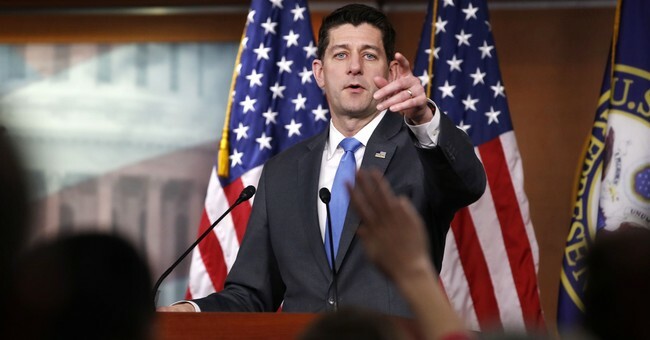 In Ryan's case, this mostly meant, during his speakership, and according to his limited-government philosophy, overhauling the tax code and cutting tax rates to spur private endeavor and thereby strengthen the economy. The overall idea was -- is -- less dependence on government, rather than more; fewer calls for more public spending; fewer want ads for government servants. The tax cut bill will do just so much, and no more, for the national weal. I find it ridiculous that critics -- Democrats but also some Republican deficit hawks -- have little good to say about it. Democrats -- yes, back to them. In the coming fall elections, Democratic chances of gaining House control are appraised as reasonable (though polls vary from week to week). What will the Democrats perforce be saying to the voters: Elect us, because... because why? To kick Donald Trump in his ample derriere? That gets you just so far. Politicians aspiring to national control have some duty to tell you not just what they hate but what they love. Paul Ryan's orientation toward responsible freedom suggests the need for a counter-orientation. What's the progressive answer to Ryan's hope of loosening a bit our government manacles? It's time to lay down some cards on the green baize. If Paul Ryan's critics want higher taxes and increased regulation, let them step forward to explain why. They'd like to reconstruct Obamacare? At what cost, and with what prospects, this time, for success? If they seek more power for unions, it's fitting that they should tell us how, currently, allowing teachers to strike against their pupils strikes a blow for intellectual advancement. I do not say that the Democrats are incapable of making some case or other for advancing the federal takeover of American life. I say that we deserve to hear them explain, if they can, how the best, possibly smartest House speaker of the past half-century has sold us a bill of goods, and how his commitment to freedom has undermined our hopes and dreams, assuming we have any worth talking about.